ColorPix is a simple color picker that gives you RGB, HEX, HSB and CMYK values that can be copied with shortcut keys or single left mouse click. It has a collapsible magnifier (max. 28x) and can stay on top of other windows. NOTE: website is down, linking to archive.org. How to extract: Download ColorPix.exe to a folder of your choice and launch. Website down and download link unavailable. 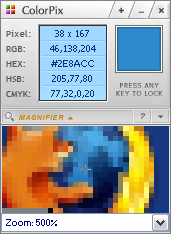 Easily my favorite color picking app, mainly for the compact size, any key locking, and one-click copying of values. Adding HSL values would make it even better. Category for this kind of tool, I prefer "Graphics - Color Tools" rather than "Games - Tools", what do you think?